A visit to two of the most famous, majestic and valuable religious buildings in the province: the Cattedrale di Palermo and the Duomo di Monreale. 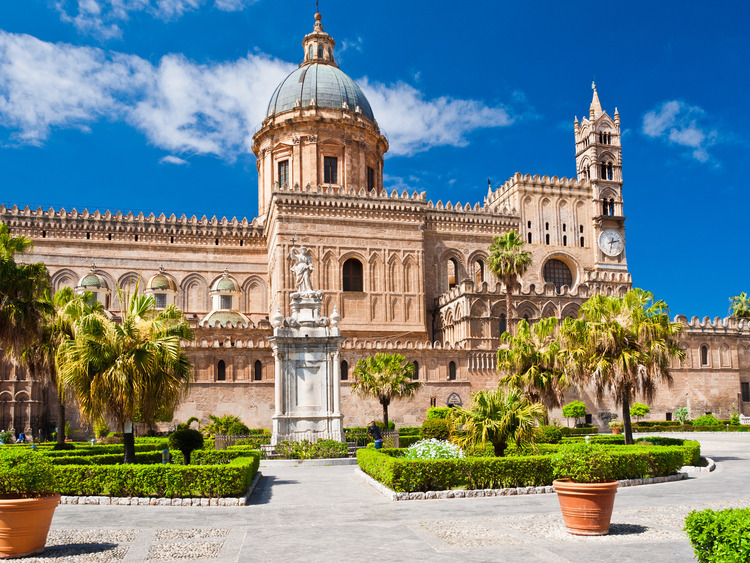 From the port, our guide will accompany us through the historic centre of Palermo on a panoramic walking tour, during which we can visit the stunning Cattedrale. - A coach will then take us to Monreale to visit its key architectural highlights: the Duomo, a classic example of Norman art, with Arabic, Nordic, classic and Byzantine elements, the inside of which is illuminated by magnificent gold mosaics. Besides the beauty of the Cathedtal of Palermo and the Cathedral of Monreale do not miss the unique taste of the “Arancine” (speciality of the Sicialian cuisine). The best combination between culture and gastronomy: discover the beauty of art in Byzantine style and the tasty “arancine” (speciality of the Sicialian cuisine). At the end of the visit we will have a little free time to buy souvenirs. The excursion to the Cathedral of Monreale involves walking up and down stairs. During religious functions the visit to the Cathedral of Palermo and the Cathedral of Monreale will only be tours of the exteriors. In this case, the tours of the interior are replaced by tours of the Martorana Church in Palermo and the Benedictine Cloister of Monreale respectively.